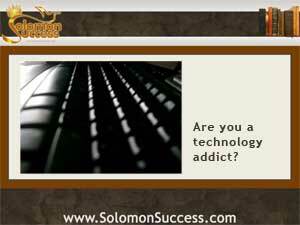 Solomon Success > Blog > Are You a Technology Addict? Computers, tablets and smartphones weren’t a part of King Solomon’s world, but his advice to approach life with wisdom and prudence certainly applies to their use. In our digitally connected world, it’s possible to be too connected to those devices – and it takes a hefty dose of the wise King’s advice to avoid that kind of draining addiction. The term “technology addict” is making the rounds in psychology circles, intended to describe those constantly connected folks who feel anxious and depressed if they can’t get to their Facebok page or Twitter account. And that kind of addiction is especially prevalent among players of online games and heavy users of social media. But even without that kind of need to stay connected, experts say it’s important to reduce our dependence on devices – and relearn ways to connect in the “real” world. Too much time on social media can make some of us feel less, not more, connected. And conducting all interaction through emails and texts robs us of cues like tone of voice and body language – and it’s hard to get a hug through the phone. How can you tell if you’re a tech addict — and what can you do about it? Although digital tools have made work and private life easier and far more convenient, its wise to have a backup in case the unthinkable happens: A phone falls into a lake, your computer crashes, there’s major power outage or any number of other unexpected mishaps. Limit mail and social media checks, and schedule them so you keep track of the time you spend. It’s easy to justify checking mail “just this once,” but it’s easy to become trapped. Keep social media friends to a manageable number – and be mindful of what you share. Turn off your phone at social gatherings – even if you need it for work. And try making notes the old fashioned way, with pen and paper.